The post CryptoCarz: Multiplayer VR Racing Powered By Blockchain appeared first on VRScout. Battle royale games are the new hotness. Your kids are playing them, I’m playing them, you’re probably playing them: we’re all playing them. Whether you prefer PUBG’s slow-paced realism or Fortnite’s fast-paced action and base building, or even H1Z1’s vehicular-focused Auto Royale mode, there is certainly a battle royale game out there for just about everyone. A few developers have tried to capture that thrill for the VR market, but no one has really succeeded. The typical designs don’t carry over easily and there aren’t enough people in headsets yet. Rec Room developer Against Gravity is hoping to have a work around for those issues. Simply dubbed Rec Royale, this new game mode will put 16 players (that’s a lot less than 100) against one another in an all-out war to be the last man standing. The setting is a national park’s forest, complete with lots of trees, mountains, and rivers — as well as “tons of loot for scavenging” according to a PlayStation blog post by Against Gravity’s Community Designer, Shawn Whiting. Just like the rest of Rec Room this new Rec Royale mode will be 100% free and fully cross-platform across PSVR, Rift, and Vive. The new game mode will introduce a few new mechanics for the title as well, such as a backpack for quick swapping weapons. The new game mode will host a public alpha test for all registered Rec Room players on May 25th (that’s this Friday) lasting until May 27th on all platforms in preparation for the game’s full launch on June 7th. Despite the fact that this sounds more like a classic King of the Hill game mode with clever “Battle Royale” marketing attached to it, I’ll certainly be checking it out. Let us know what you think of the news down in the comments below! Oculus Go and Gear VR owners should find classic board game Boggle playable with friends in Oculus Rooms today. The post Rec Room Update Adds Adorable Battle Royale Mode Next Month appeared first on VRScout. The change comes amid new European privacy regulations and an international movement calling into question Facebook’s platform and business model. Earlier this month, CEO Mark Zuckerberg appeared before Congress to answer questions about the company’s handling of personal data. Also, in a few weeks at the F8 developer conference, Facebook is expected to provide launch details for the $200 all-in-one Oculus Go VR headset. The consumer-focused launch represents a big moment for Facebook as its first standalone consumer product. Go launches six years after Oculus was founded and more than four years after Mark Zuckerberg decided to acquire it. Oculus first launched with the Gear VR for Samsung phones and its high-end Rift headset sits atop Microsoft’s Windows. With Go’s launch, a VR headset will stand on its own for the first time as a self-contained consumer product at a pretty alluring price. For the early VR developer community, there’s hope Go might open up a new active (and paying) user base. 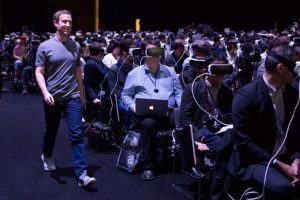 I’ve also heard from developers, though, who remain concerned about releasing their virtual worlds on Oculus platforms for reasons ranging from how Facebook collects and handles personal data to how it influences democracy going forward. “It’s an existential crisis for us to make sure we get data handling right,” said Max Cohen, head of product for the Oculus Platform, during a phone interview. What Information Does Oculus Store? When Oculus launched the Rift in 2016 the company started storing snapshots online, once per minute, of the actual and “average” position of the Rift and Touch controllers. Until recently, this data was connected to individual Oculus accounts. “We realized over time that we don’t need to associate movement information with your account to make our systems work, so we moved to a system where all movement data is now de-identified,” an Oculus spokesperson wrote in response to questions. For those unfamiliar, the Oculus Rift headset and Touch controllers which come packaged together are precisely tracked using sensors that are little more than slightly modified webcams looking for dots of light on the surface of the gadgets. The Mirage Solo standalone headset powered by Google’s WorldSense tracking technology launched just days before the Google I/O developer conference, and yet a long keynote event came and went without mention of VR. The $400 VR headset from Lenovo is the “first” Daydream standalone, but despite Google using that word to describe Mirage Solo no manufacturers have publicly committed to building a second one. The hardware is a big step up technically compared with Oculus Go, and it can run the entire Google Play catalog, but Lenovo’s Mirage Solo is unlikely to convince the masses that VR is a must buy. With no new information about either internal products like Daydream View or partner products like Mirage Solo — it makes sense that some developers and early adopters might be wondering if Google is still committed to VR. Over the last decade Google has partnered with other companies to enable a variety of initiatives centered around its Android operating system. In recent years, though, Google started to launch its own products while bringing more work in house. For example, the tech giant recently acquired teams from HTC that worked on its Pixel phone. Was VR overlooked at I/O because Google is shifting focus to developing VR and AR products internally? EA is famously conservative on VR’s chances and has said multiple times that it will only fully commit to the technology when the market is there. That hasn’t stopped the publisher greenlighting a handful of VR experiences including Star Wars: Battlefront’s X-Wing VR mission and Need for Speed on Google Daydream over the past few years, but we seriously doubt it’s got any big projects in the pipeline right now. Still, we’ll be watching for Battlefield V alone. Two years ago Microsoft introduced its Xbox One X console, then codenamed Project Scorpio, to the world by promising the machine would be capable of “high fidelity VR”. Six months on from the 4K console’s release and we haven’t heard so much as a peep about X actually getting that support any time soon. At this point we suspect Microsoft might have abandoned its plans for VR on its most powerful console yet but, hey, there’s always a chance. Bethesda arguably carried VR all by itself last E3, announcing Doom VFR and Skyrim VR as well as a release date for Fallout 4 VR. All of those games are now out, so we’re not entirely confident that there will be more to share at this year’s show. That said, the company has an enormous back catalog of games just ripe for VR ports and we’d welcome more of those, if not something entirely new. Wolfenstein VR, anyone? Devolver Digital currently has the reigns on one of VR’s best games, Gorn, which remains in Early Access. E3 would be the perfect time to talk about the full release, or any number of other VR games the publisher may be working on, but we somehow doubt they’ll share much. That’s down to the fact that last year’s event ended in bloodshed. Over two years ago now, we reported that 3D audio company Ossic had raised a massive $2.7 million in crowdfunding for a pair of headphones designed for use with VR headsets. At the time, that made it the highest-earning Kickstarter campaign in the platform’s history. Yesterday, Ossic announced it was shutting down operations and canceling pre-orders. “It is with an extremely heavy heart that we must inform you that OSSIC is shutting down and will be unable to deliver the remaining OSSIC X headphones,” the company wrote in an update on its website. According to the post, Ossic failed to raise enough investment to bring the X into full mass production. The company was looking to raise a further $2+ million. The Ossic X was designed to deliver true 3D audio across a range of platforms including VR. The Kickstarter page promised ‘The World’s Most Advanced 3D Audio Headphone’ which could recreate sound in the same way we perceive it in the real world. We were impressed by the headphones when we tried them in February 2016. According to Ossic, VR’s “slow start” and other startup failures made it tough to find further funding for the product, while the scope of the project ultimately made it too costly. During the Kickstarter campaign, the X could be pre-ordered for $199 at an Early Bird discount that shaved $200 off of intended $399 price. 80 backers had also pledged at least $999 in order to grab an early, hand-built version of the device. But Ossic’s funding didn’t stop at Kickstarter. The company later raised a further $3.2 million and yet more pre-orders on IndieGoGo and then secured even more funding through an angel investment round. This allowed the team to ship those 80 initial units to the highest backers, but the other 22,000+ pre-orders will go unfulfilled. Ossic’s post doesn’t mention refunds, though given that the company is, in its own words, out of money, it doesn’t look likely. We’ve reached out to the company to ask about that possibility. Minecraft may sadly be missing from the list of apps on Oculus’ new Go headset, but the game is still going strong on Rift, Gear and Windows VR headsets with a fresh update this month. Late last week developer Mojang launched the Aquatic Update for the smash hit game across both traditional platforms and supported VR headsets. This first of a two-part update adds a major new feature to the game: swimming. We’ve always been able to jump into water and dig around, but with the Aquatic update players will find entire oceans to explore across nine biomes (frozen, deep frozen, cold, deep cold, lukewarm, deep lukewarm, normal, deep normal, warm). Water itself has been redesigned to be clearer so you can actually see where you’re going. It’s hard to believe that Minecraft has been around this long without introducing oceans but the sheer size of this update makes it seem like it’s been worth the wait. Players will be able to hunt for treasure chests in shipwrecks, wield a trident and unlock eight new achievements. On land, meanwhile, you’ll be able to climb into icebergs and you can also swim with dolphins to get a speed boost. The second part of this update will be coming soon, according to Mojang, and will add a handful of new features that weren’t squeezed into this release. It’s great to see Minecraft still getting VR updates, even if we have no idea how many people are actually playing it with a headset. The VR version offers the complete experience with cross-play so that you can join friends on Xbox One and more. Now, if we could just get that Oculus Go port sorted out. Just over a year ago now Sony revealed a slate of new games coming to PS4 via its China Hero Project, which lends support to Chinese developers. Among these games were a handful of PSVR titles that caught our eye. Last week, we got an update on how they’re coming along. The below video catches up with a handful of the developers included in the project. On the VR front there’s Animal Force, Kill X and Pervader VR. Animal Force is one you’ve likely heard of by now; it’s releasing on PSVR later this week, offering a unique take on the tower defense genre. Kill X is also one we’ve had our eye on for some time, especially after playing a demo of the game on the Asian PlayStation Store. It’s a first-person shooter (FPS) that has players exploring dark caves and taking on hordes of monsters. The most progress, though, seems to come from Pervader VR, which didn’t have any gameplay to speak of this time last year but now has some pretty promising footage developed on Unreal Engine 4. It looks like another FPS in which we’ll be taking down monsters. Sadly there’s no sign of The Walker, which was one of the most interesting PSVR titles revealed last year. It’s not clear if the game is still in development right now. The video mainly focuses on how the development teams are holding up rather than showcasing their games, but it’s a good reminder that there’s some promising stuff on the way for PSVR fans. When these games will get a western release remains unclear. The post Enormous, Multisensory Arena Heads To Las Vegas Strip 2020 appeared first on VRScout. DLC’s major benefit for Go and Rift developers will be the ability to start charging for additional characters, levels, and stories, an addition that comes with positives and negatives. On the plus side, Oculus developers will be able to continue to expand existing titles with new content with microtransaction-style monetization, rather than requiring the purchase of a “sequel.” But paid DLC could also reduce the number of free content-adding updates gamers have come to expect, depending on how developers implement it. Oculus also suggests that the change can keep initial game download sizes down. Until now, Oculus developers had to add new content to the original game as free patches, expanding their storage requirements. DLC support enables either paid or free additions to take place separately — a feature that could be particularly useful with space-constrained standalone Go headsets. The Oculus developer blog notes that the feature is available now “in beta form” for the Mobile Store and recommends privately testing downloads before delivering them to the general public. The post NBA 2017-2018 VR Highlight Reel Arrives Free On NextVR appeared first on VRScout. Whether you want to immerse yourself in one of the most topical TV shows out right now from HBO, rack up headshots with your bow and arrow skills, or venture into the neon-soaked nostalgia trip of a 90s era shooter, there’s something for just about everyone this week. What if you could teleport yourself inside the monitor screen of a 90s era FPS in the vein of Wolfenstein and classic DOOM? That’s exactly what Compound does, complete with pixelated graphics and everything. But don’t let the simplistic art style fool you: this is actually one of VR’s smartest shooters to date. If I could use VR to venture into the world of some of my favorite TV shows, I’d be a very happy man. Luckily, Silicon Valley is one of those shows for me and this VR experience lets you visit the iconic hacker hostel that’s prominently featured in Seasons 1-4 of the hit HBO dramedy and features hundreds of things to interact with. If the successes of Vanishing Realms and Skyrim VR have taught me anything, it’s that VR needs more fantasy-themed dungeon crawling experiences. Luckily, Fadeholm is a brand new entry in the budding genre. All of the dungeons are procedurally generated so you won’t see the same layout twice and you need to manage resources like your hunger, health, and endurance to survive. We’re eager to see how this one evolves through Early Access. Shooting a bow and arrow is still one of my favorite things to do in VR, so when a game comes along that focuses on that specifically, while wrapping it up with a strong narrative and dense world to explore, you’ve got my attention. This one is aiming to be more than just a wave shooter. The post Oculus & ESL Return For VR League: Season Two appeared first on VRScout.